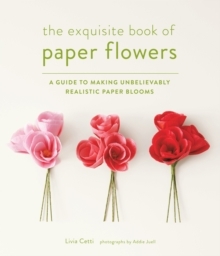 Livia is best known for creating high style, gorgeous and unbelievably realistic paper flowers and in The Exquisite Book of Paper Flowers, she will share her until-now secret techniques for 27 of her most popular flowers, including peonies, poppies, roses, hibiscus and camellias, all made with tissue and crepe paper. 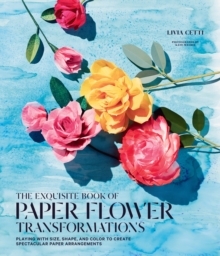 She will then show readers how to combine the flowers to make 21 projects, such as garlands, tabletop arrangements, cake toppers, bouquets, wreaths, boutonnieres and hair clips. The projects are perfect for home decor, gifts, accessorising and entertaining. It's surprisingly easy and fast to create flowers by hand and the only supplies needed are tissue or crepe paper, scissors, glue, floral tape, wire and sometimes basic household bleach. The step-by-step photos incorporated throughout ensure that crafters of all levels can succeed in making any of these realistic blooms.